& Get Credit on New Innovative Products! 3. Sign & Return the exchange form via fax/email. You’ll receive credit on the exchange order you place! Your Sales Representative will send an Ortho Technology Exchange Program form and UPS shipping label to send your product to us. Each practice can do up to 2 exchanges, but there’s NO LIMIT as to how much product you can send in a single exchange! Products purchased under the Ortho Technology Exchange Program are not eligible for quantity discounts or bonus rewards, and therefore are sold at full retail price. Products being sent in for the Ortho Technology Exchange Program cannot be from our product line. 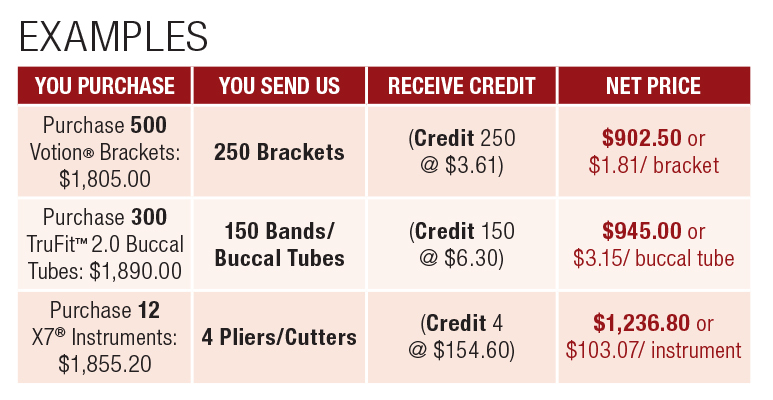 *Buccal Tubes, Bands, and Brackets have a minimum purchase of twice the amount being exchanged. Instruments require a purchase of at least three times the amount being exchanged. There is no limit to the amount of product you wish to exchange in a single order. A practice is however, limited to 2 exchanges. Your old appliances/product must be received at Ortho Technology within 30 days. Credit will not be issued until exchanged product is received at Ortho Technology.